It’s always handy to have a versatile side dish recipe in your back pocket. 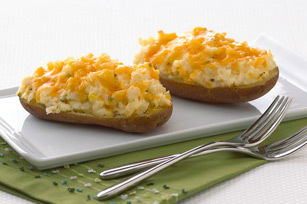 Our Easy Restaurant-Style Baked Potatoes make a great side for pretty much anything you have on the menu! Place potato on microwaveable plate. Prick in several places with fork. Microwave on HIGH 7 to 8 min. or until tender. Cut potato in half lengthwise. Scoop flesh into bowl, leaving thin shells; mash flesh with cream cheese product, sour cream and 2 Tbsp. cheddar. Spoon into shells; sprinkle with remaining cheddar. Bake 10 min. or until cheese is melted and potatoes are heated through. Serve with a bowl of broth-based vegetable soup and some sliced fruit for an easy weekday meal.